Compare the relationships between Men and Women in the two Stories, 'Tony Kytes' (The Arch Deceiver) and 'Tickets Please'. 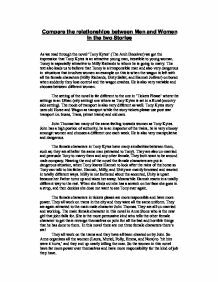 Compare the relationships between Men and Women in the two Stories As we read through the novel 'Tony Kytes' (The Arch Deceiver) we got the impression that Tony Kytes is an attractive young man, iresstible to young woman. Toney is especially attractive to Milly Richards to whom he is going to marry. The text also leads us to believe that Toney is a irresponsible man and also very dangerous in situations that involves women an example on this is when the wagon is left with all the female characters (Milly Richards, Unity Sallet, and Hannah Jolliver) on bored when suddenly they lose control and the wagon crashes. He is also very variable and chooses between different women. The setting of the novel is far different to the one in 'Tickets Please' where the settings is an Urban (city setting) ...read more. Nearing the end of the novel the female characters are put in dangerous situation, when Tony leaves Hannah to look after the rains of the horse so Tony can talk to his father. Hannah, Milly, and Unity are mainly browsed and reacted in totally different ways. Milly is not bothered about the accented, Unity is upset because her Father turns up and takes her away. Meanwhile Hannah reacts in a totally different way to the rest. When she finds out she has a scratch on her face she goes in a strop, and then decides she dose not want to see Tony ever again. The female characters in tickets please are more responsible and have more power. They all work on trams in the city and they ware all the same uniform. ...read more. The evidence for this is at the begging of Tony Kytes is states that Tony was engaged to Milly Richards instead of Unity or Hannah. Meanwhile the novel Tickets Please, John Thomas has seven women instead of three and he is currently going out with a new worker called Anne Stone. The male characters do not think their relationships should be taken seriously. For example both Tony and John are known to be very variable and choose different women as they please they also manipulate women into going out with them when they are already have a relationship with another women in the novel. There are some simulates in the relationship in the two novels for example the women characters all had relationships with the males characters before the recent relationship. The male and female characters seem to know a lot about each other like what their face looks like when they are not around, they know every one in each of their families. ...read more. This shows his seductive charms and how experienced he is. Still John Thomas is shallow and lacks commitment. He was consciously working his way through the women working on the trams and left them distraught. He had no sense of commitment, which shows him to be the opposite of Tony Kytes. She is in love with Humphery.There engagement is fixed by letter because he goes to bath for a few days. The day he is supposed to come back he doesn't come back he stays for longer but every single time he was supposed to come back he didn't come back. She goes to a hanging, after the hanging she goes into a room with the dead body. He had never found reason to regret his choice as yet, and his anxiety for her recovery was great" Hardy's language here suggests that Timothy thinks very highly of Annetta. There good relationship is continued as she tells him the truth. You didn't really mean what you said to them?' 'Not a word of it!' " She agrees even though she has witnessed all that has taken place with Unity and Hannah and knows very well that she is third choice. This again shows that, although Milly is portrayed as intelligent throughout the rest of the story, she is shown as weak. Compare the female characters in 'Tony Kytes the Arch Deceiver' and 'Tickets Please'. This was their one goal in goal in life. For example Milly agrees to marry Tony even though he has just asked two other women to marry him, right in front of her. 'If you like, Tony. You didn't really mean what you said to them' This quote proves that the women in the 19th century were gullible and subservient. He merely understands meanings and morals but follows his heart. He is very immature to how he treats the females of the village using sentiment to all, but he has such a way of entrancing his girls to believing anything that he banters on about.